Since 1999, the League of Women Voters of Lawrence-Douglas County has honored a fellow citizen with the Helen Fluker Open and Accessible Government Award. The award is given in honor of the late Helen Fluker, who was a long-time League member serving on its board and twice as its president. Her career included working for Department of Army and the Department of State. 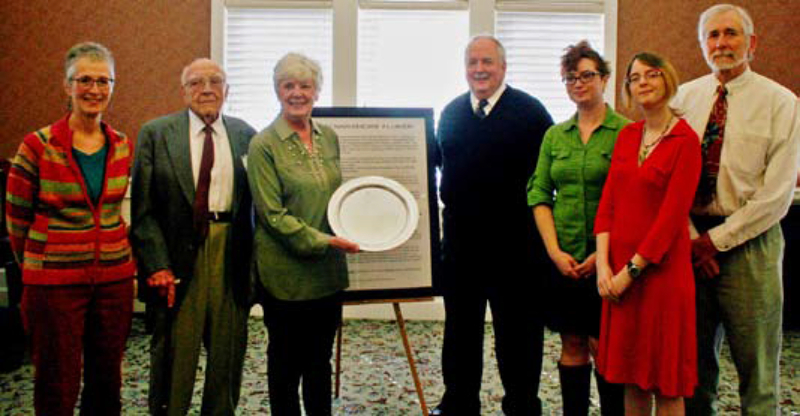 In 2019, Sonja Czarnecki was honored at a luncheon in Lawrence on Sunday, March 24. The League invites you to nominate a person worthy of recognition for contributions to your community. If you represent an organization, your nominee does not need to be a member. Feel free to submit an updated form for a previous nominee. Nominations are closed for 2019, but will re-open early next year. In 2019, we honor Sonja Czarnecki. Sonja is the Dean of Students and a history teacher at Bishop Seabury Academy in Lawrence. She was nominated for her success in helping students understand and engage in the political process. In 2018 we honored Laura Bauer. Ms. Bauer is a reporter for the Kansas City Star. "In November 2017, the Kansas City Star published a series of front-page articles that, according to a subsequent editorial, revealed “…a concerted and disturbing effort by officials at all levels of Kansas government to keep the public’s business secret. The articles were extremely well-done and, my opinion, are Pulitzer-worthy. In the aftermath of their publication, several legislators have said they’ll support legislation -- assuming a bill makes it all the way the House and/or Senate floors meant to increase transparency. It now appears that transparency also will be an issue in the 2018 elections. Newspapers across the state will be asking candidates which they prefer: Sunshine or darkness? I am nominating Laura Bauer for the Helen Fluker Open and Accessible Government Award because in my opinion, she wrote the story that led to The Star to committing the resources that led to the series." The League of Women Voters of Lawrence-Douglas County (LWVL-DC) selected Dr. Alan Cowles, MD., Ph.D to receive the 2017 Helen Fluker Open and Accessible Government Award. The Fluker Award honors a Douglas County resident who shows leadership in promoting citizen participation to government. Dr. Cowles was recognized for his community leadership in promoting transparent, open government. The award was presented at the annual Helen Fluker Award Luncheon held on March 18, 2017. The Lawrence-Douglas County League of Women Voters selected Ruthi Rapp to receive the 2016 Helen Fluker Open and Accessible Government Award. The Fluker Award honors a Douglas County resident who shows leadership in promoting citizen participation in government. Ms. Rapp is recognized for her community leadership in promoting improvement in government through her work with the Boys & Girls Club of Lawrence encouraging and facilitating Kids Voting Kansas. She was honored at the Fluker Award Luncheon on Saturday, March 19, 2016. Ms. Rapp has volunteered for Kids Voting Kansas for many years, acting as the sole liaison to bring the education program into all 14 Boys & Girls Club locations in Lawrence. She has increased youth participation in Kids Voting Kansas to 6,723 by exposing youth to the experience of participating in the democratic process. Ms. Rapp worked with the Boys & Girls Club staff to implement citizenship curriculum and activities leading up to voting day. She put together age-appropriate activity notebooks for each site that can be used for many years. As a result of her efforts, more youth in Lawrence are growing up as informed citizens who will now have the tools needed to participate actively in local and national government upon reaching adulthood. Ms. Rapp's impact on future citizen participation is immeasurable. The sixteenth annual Helen Fluker Open and Accessible Government Award luncheon was held on March 7, 2015 at the Smith Center at Brandon Woods. Sandy Praeger was recognized for her community leadership in multiple endeavors related to making government processes and agencies more accountable, accessible, and open. Sandy Praeger has served as Lawrence City Commissioner, Lawrence Mayor, Kansas Legislator, Kansas Senator, and Kansas Insurance Commissioner. As Kansas Legislator, Sandy helped develop the school breakfast program, helping to feed thousands of Kansas children. In the early 1990's, she joined a collaborative effort to create HealthWave (SCHIP) which offers affordable, low-cost health insurance for Kansas' uninsured children. She was a founding member of Health Care Access, of the Haskell Indian Nations University Foundation, and the Court Appointed Special Advocates. She served as President- Elect/Secretary/Treasurer of the National Association of Insurance Commissioners, and was a Vice-Chair of the National Association of Insurance Commissioners Midwestern Zone, and on the Board of Directors of the United Way of Douglas County. As Insurance Commissioner, Sandy has been a tireless advocate for access to health insurance, speaking out about the benefits of the Affordable Care Act, lobbying for Expanded Medicaid, and sounding the alarm on the multistate Health Care Compact. Her public life has been marked with consistency and concern for the welfare of all citizens. © Copyright League of Women Voters of Lawrence-Douglas County. All rights reserved.